Clayton R. Eddings passed away Sunday, January 20, 2019. Graveside: 2 p.m. Thursday in Jaybird Cemetery, Parker County. Visitation: 6 to 8 p.m. Wednesday at Biggers Funeral Home. 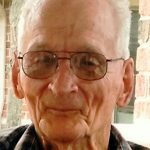 Clayton R. Eddings was born May 29, 1930 in Silsbee to the late Albert and Ollie Eddings. He was a retired welder. Clayton was preceded in death by his wife, Alma Eddings; parents; and four siblings. Survivors: Daughters, Karen Campbell and husband, Noah, Sandy Guerrero and husband, Frank, and Sonja Klein; four grandchildren; and four great-grandchildren. Be the first to share a memory of Clayton.